After numerous repeat trips to the craft beer store and many minutes spent scouring the isles for interesting new brews to try, I eventually reach a saturation point. Aside from seasonal rotations, I inevitably glaze over at the same array of familiar labels greeting me each visit. So when something new and interesting pops up on the shelf, I tend to take notice. This time it was a new offerings by Portland, Oregon-based Gigantic Brewing Company — the new kid on block on VT beer shelves. I went out on a limb, and my tastebuds are impressed. Available only in big 22 oz. bombers, this flavorful IPA is a nice West Coast addition to VT’s craft beer market. The ABV comes in at 7.3 % with this one, so watch out! Label – Blammo! The art jumps out right away with bold colors and a cool comic book-style font that tingled my nerd spidey-senses. Appearance – This IPA pours a very clear light golden with a thick creamy head. Looks delicious. Aroma – Very fruity right from the get-go. Citrus, tangerine, and melon aromas mingle with the strong crispness of a dense pine forest. Lovely on the senses. Yup, I’m salivating. Color me excited. Taste – There’s a pleasant lightness to this brew that belies it’s potent strength and robust flavor. A wash of fruity sweetness hits up-front without being cloying. The hop flavor kicks in mid-way alongside strong pine and orange rind notes as a parting gift. There’s a ton of hop flavor here but practically none of the bitterness you’d find in more aggressive IPAs. It’s a more delicate touch than expected, and I diggit. 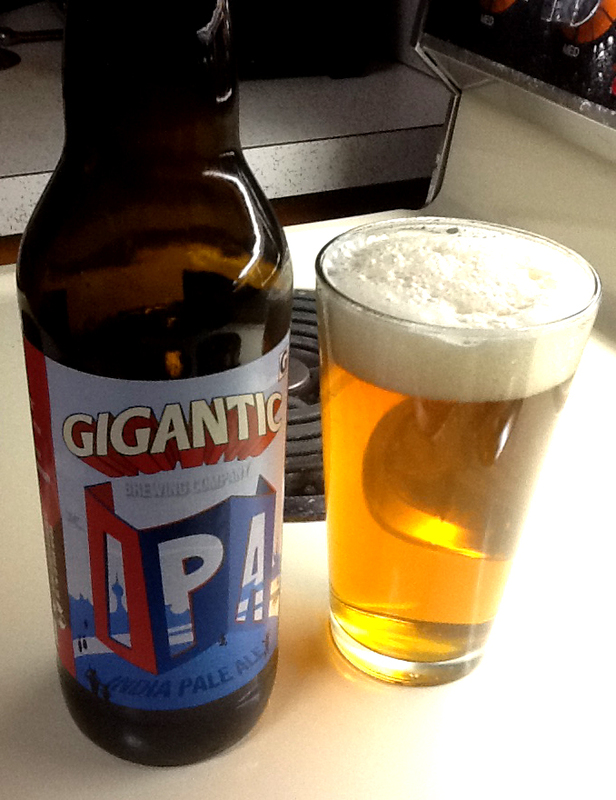 Overall– I’m a huge fan of the high-caliber hop-blasters, but Gigantic’s IPA is a refreshing change of pace and a real pleasant surprise. There’s a thoughtful balance to this brew that favors flavors over tongue-raking brutality. A real winner in my book. I’d readily crack open a second bottle, if I could see straight. This entry was posted in Beer Nerdistry and tagged beer, beer nerdistry, beer reviews, craft beer, freelance, geek, gigantic brewing company, gigantic ipa, magic hat, nathan meunier, nerdy beer, Review, writing by nmeunier. Bookmark the permalink.